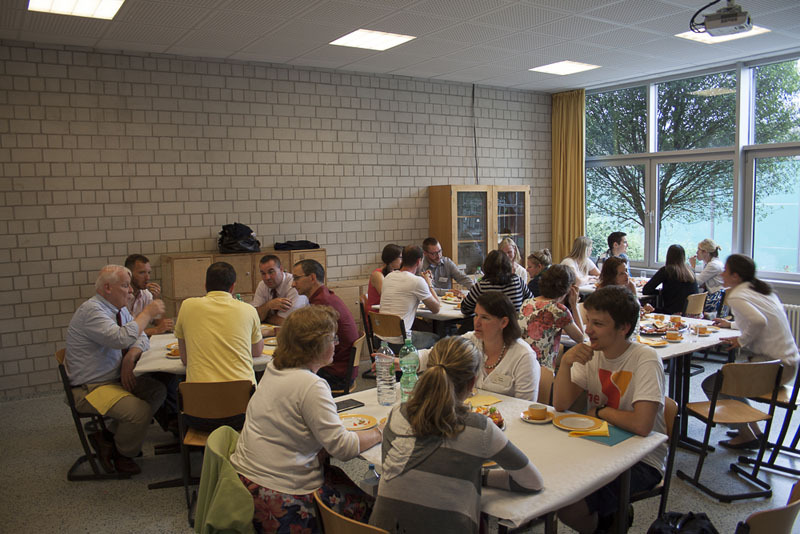 Study Trip for Social Studies Teachers 2015 - Atlantik-Brücke e.V. 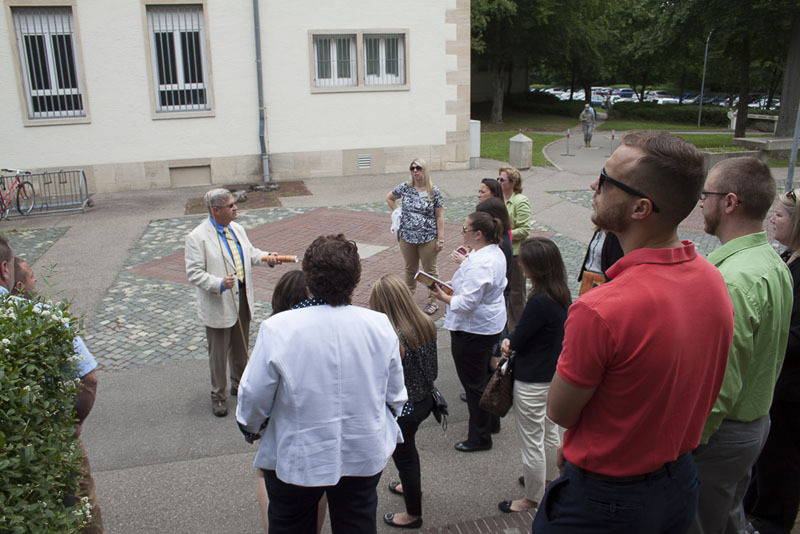 Once a year, Atlantik-Bruecke invites a group of American social studies, history and German teachers to participate in a week-long study trip through Germany to get a comprehensive picture and understanding of the country. 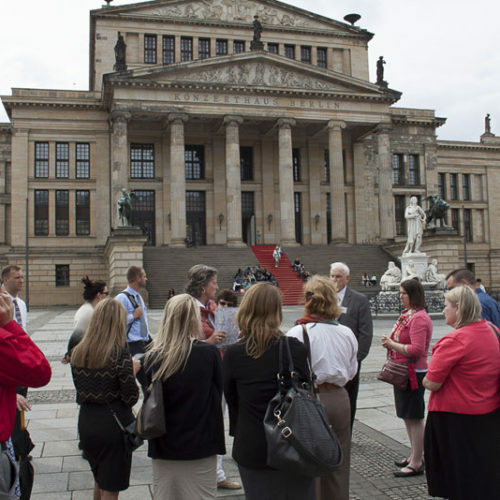 The different parts of the trip are carefully chosen by Atlantik-Bruecke and take the teachers to German schools, small and corporate businesses, political and educational institutions as well as places of historic significance. 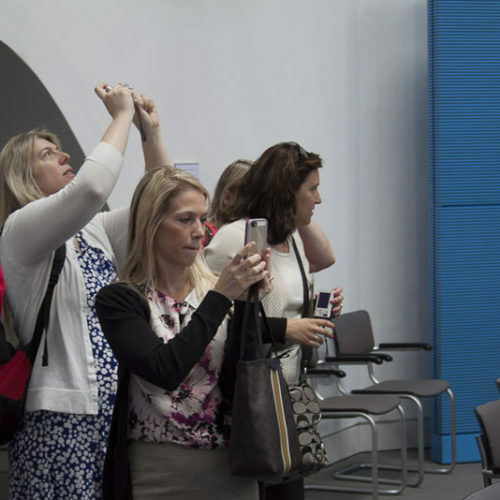 The idea and goal behind these study trips is for the teachers to share their experiences and impressions with their students, colleagues and friends once they return to the United States, deepening the cultural and historical understanding. 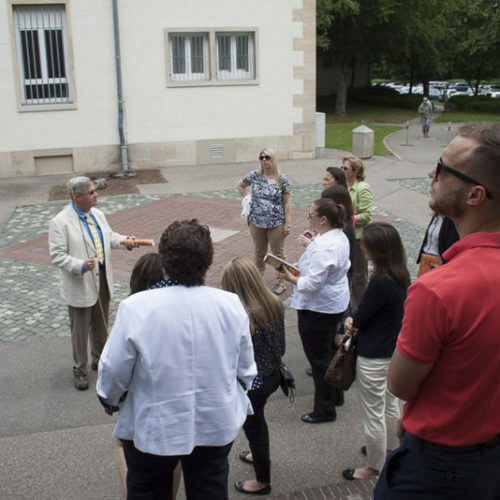 Atlantik-Bruecke has been arranging such study trips for many years now and so far welcomed hundreds of teachers from all over the United States. The 2015 program was offered in close cooperation with the office of Congressman Charlie Dent (R – PA) who also supported the selection process of the teachers. This year the regional focus lay exclusively on Pennsylvania. All teachers were expected to have several years of professional teaching experience in a relevant subject. 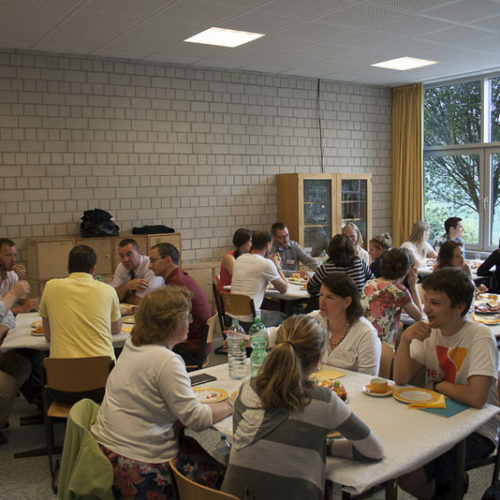 Atlantik-Bruecke was looking for candidates that showed a genuine interest in cultural exchange and could demonstrate how they plan to utilize this experience for the benefit of their students and fellow teachers. Thorough preparation of the materials provided by Atlantik-Bruecke was expected of each candidate. Eventually ten women and five men were selected to come to Germany. 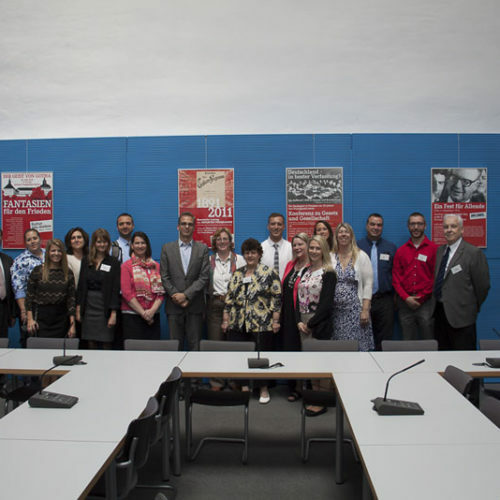 The study trip took place from the 14th to the 21st of June 2015 and led the fifteen teachers all across Germany to the cities of Stuttgart, Dresden, Leipzig and Berlin. 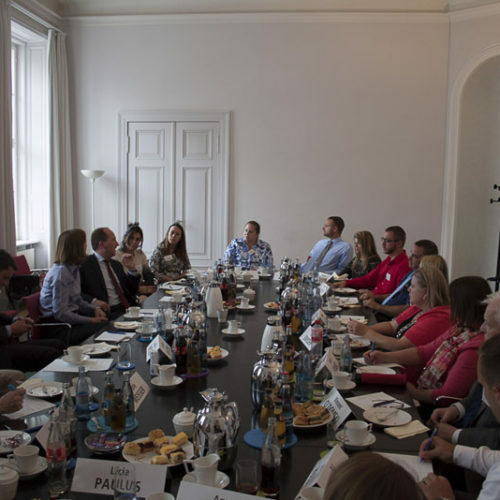 During this intense week the teachers met German students, historians, high-ranking political leaders as well as the heads of some of Germany’s most exceptional businesses. 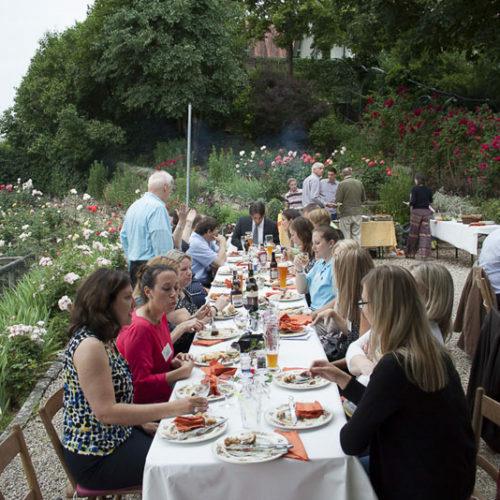 A number of Atlantik-Bruecke members invited the group to their homes for conversations and discussions in a more private setting. 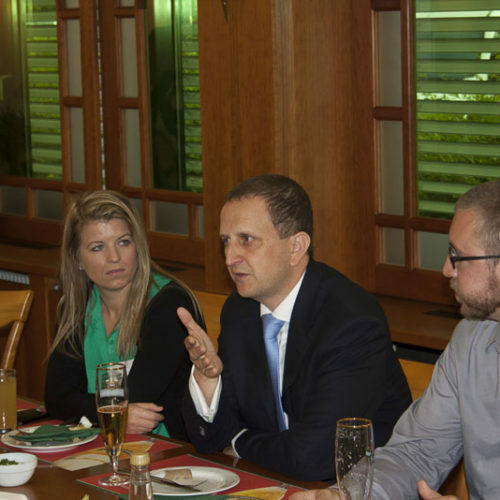 Among them were Harald Leibrecht, President, Board of Directors of the CEPA Foundation, Ingersheim and Karsten Uhlmann, Atlantik-Bruecke member of the board and CEO of Frankfurter Brauhaus GmbH, Frankfurt an der Oder. 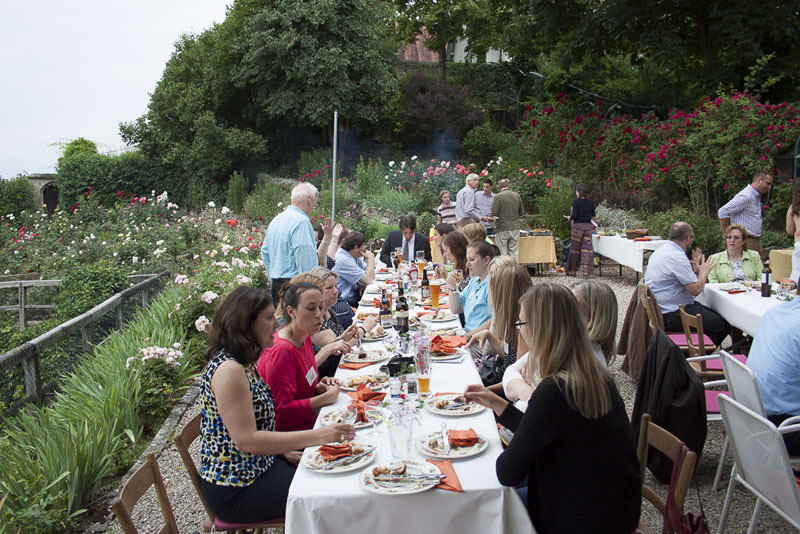 Harald Leibrecht and his family welcomed the group to a BBQ at the family’s historic castle Schloss Ingersheim. Karsten Uhlmann took the teachers on a tour through the Feldschlößchen brewery and spoke of his upbringing in the GDR over dinner. In Berlin, the group visited the German Bundestag and met with Atlantik-Bruecke members Andreas Lämmel, MdB (Christian Democrats) and Stefan Liebich, MdB (The Left Party). 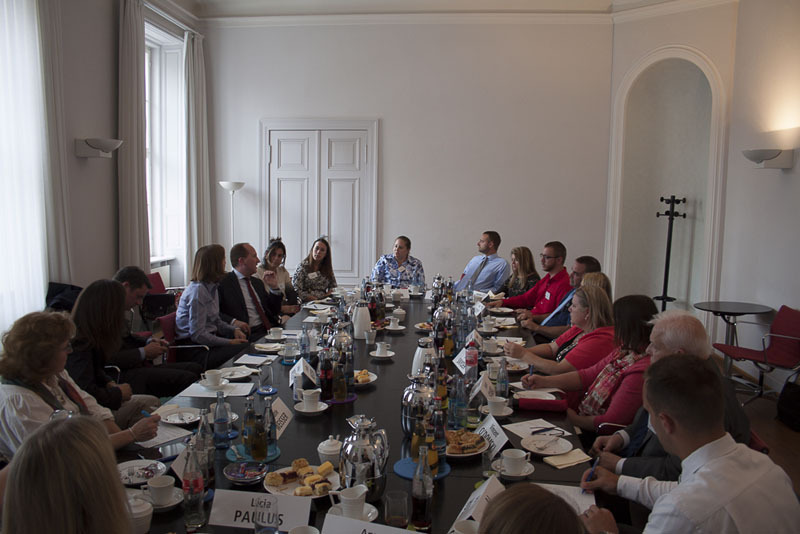 Andreas Lämmel and Stefan Liebich discussed the current political issues in Germany with the group and shared their views on the crisis in Greece. The teachers were positively surprised by the level of transparency and comradery among the leadership. Afterwards the group headed to the foreign ministry for a joint lunch with Jürgen Hardt, MdB (Christian Democrats), Coordinator of Transatlantic Cooperation. Mr. Hardt, an Atlantik-Bruecke member, spoke of Germany’s global role and gave insights to the conflict in the Ukraine as well as current challenges for the transatlantic relationship. 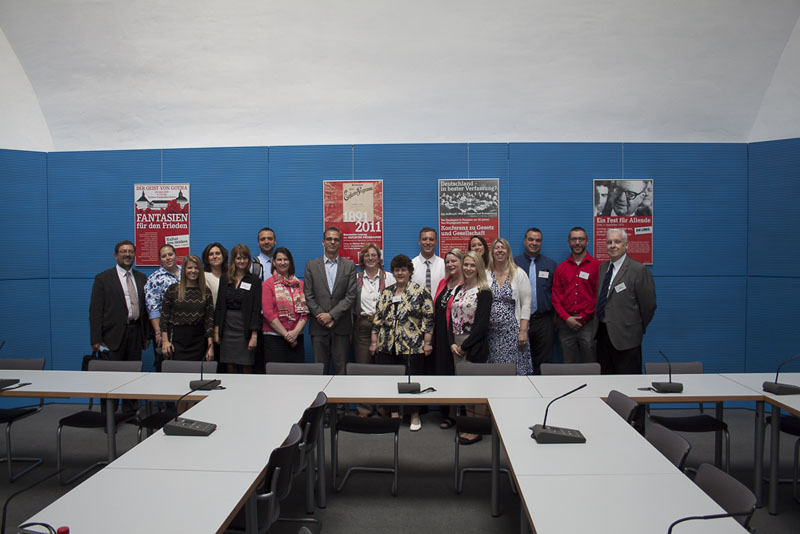 At the United States European Command Headquarters (EUCOM) in Stuttgart, Ambassador Patrick Moon welcomed the group for a briefing, explained the deep and successful military ties between the United States and Germany and put them into a historical and contemporary perspective. 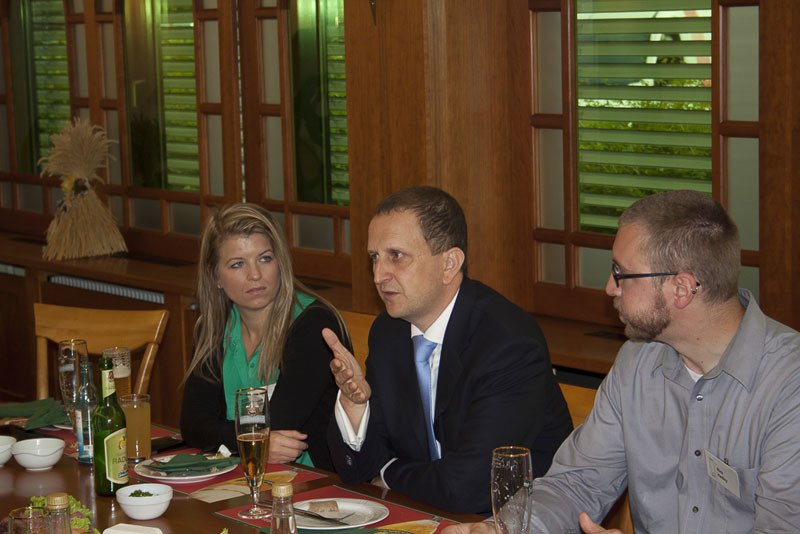 In Stuttgart, Minister Alexander Bonde (The Greens/Alliance ‘90), Ministry of Rural Affairs and Consumer Protection Baden-Württemberg, met the group for a joint lunch. Minister Bonde talked about the differences in consumer protection between the EU and the United States, thereby illustrating some of the challenges of successfully negotiating the Transatlantic Trade and Investment Partnership (TTIP). 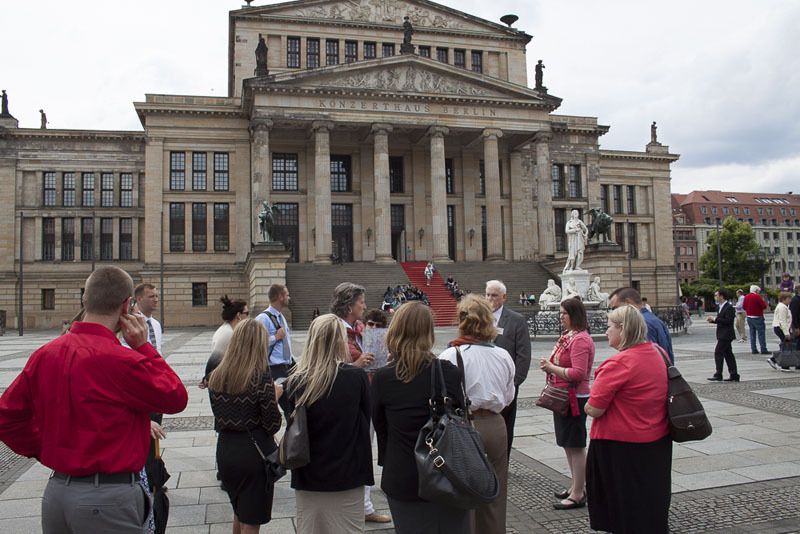 One core element of the study trip and naturally of great interest to the teachers is the German educational system. The teachers visited the renowned Friedrich-Schiller-Gymnasium near Stuttgart and joined the children in their classrooms. In Dresden, the group visited the Berufsschulzentrum für Elektrotechnik Dresden (Vocational School) and got to experience and understand the German dual educational system. In both institutions the group had engaged exchanges with the students and their teachers and in some cases even decided to become pen pals. Another important element of the trip is to experience the German business world. 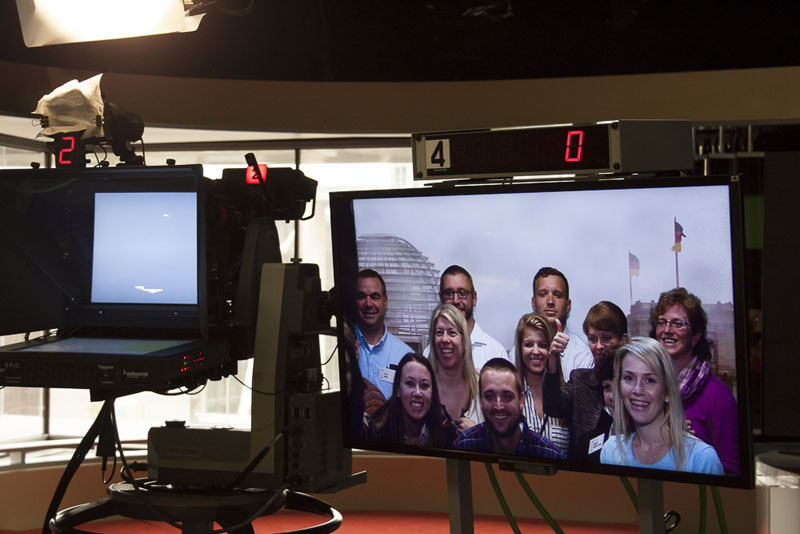 This began with a meeting at the Daimler AG headquarters with the department of external affairs. Here, the group received insights to the concerns, potentials and overall global strategy for the company’s Mercedes brand cars. 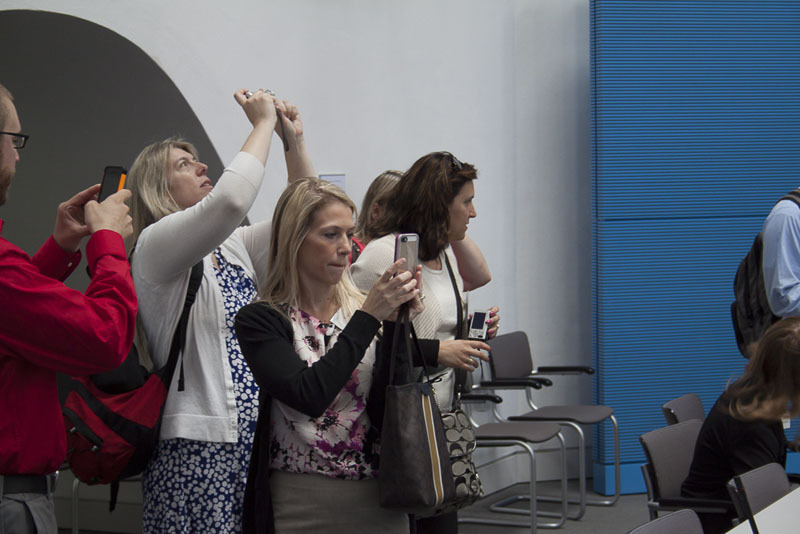 At Bell Flavors & Fragrances in Leipzig, American-born CEO Michael Heinz introduced the teachers to some of the origins of well-known scents and tastes in the food industry and spoke of his experiences as an American living in Germany. In Berlin, Launch Manager Martin Bell of Rocket Internet SE introduced the group the local start-up scene. Afterwards the teachers visited the office of Atlantik-Bruecke for an Energy-Talk with Atlantik-Bruecke member Dr. Wolfgang Dierker, Director Government Affairs & Policy, General Electric Germany, Berlin, Dr. Joachim Lang, Head of Berlin Office, E.ON AG and Marie-Christine von Hahn, Head of Group Representative Office Berlin, Aurubis AG. The discussion revolved around Germany’s energy mix, energy related policies and the public’s concern regarding fracking. Coming from Pennsylvania, the teachers were very informed and interested on the experts’ opinions on fracking technology. 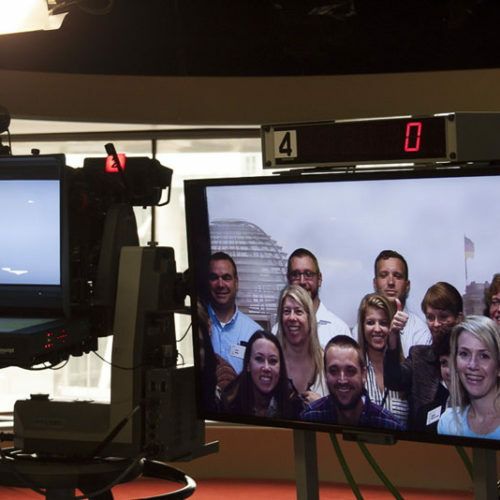 At the ARD Berlin studio (German television), TV correspondent Arnd Henze explained the functioning of German public broadcasting and shared his views on current political issues and the role that the German media should play with respect to coverage. Naturally the teachers were also keen to broaden their understanding of German history. The group visited the Sachsenhausen Memorial and experienced firsthand the darkest chapter of Germany’s past. A guided tour of the Berlin Wall Memorial illustrated the former division of Berlin, explained the geopolitical reasons behind it and gave insights to life in the GDR.